Over on the Lost Cartographers’ new blog, I’ve posted four potential album cover designs for our debut CD, “Walk On.” Use the comments section there to tell us which one you like the best, and you could win a free copy of the CD once it’s released! 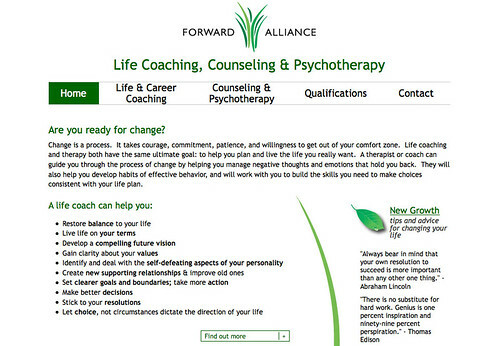 I recently wrapped up a site design for Forward Alliance, a life coaching and psychotherapy practice run by Ioanna Chaney. It was an interesting process, as it allowed my Design:Intelligent colleague Katie Petrak and me to experience building a small business brand from the ground up. 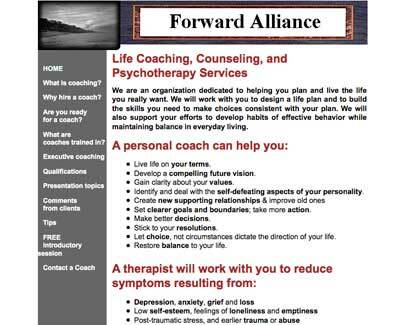 When Ioanna came to us, she had an existing website that was generally serving her needs; however, she felt that it could use some reorganization and a visual overhaul. 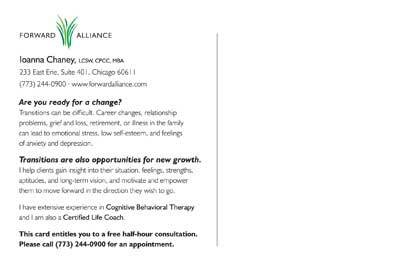 She also wanted a postcard-sized mailer that could be used to market her services to other professionals in her building, etc. 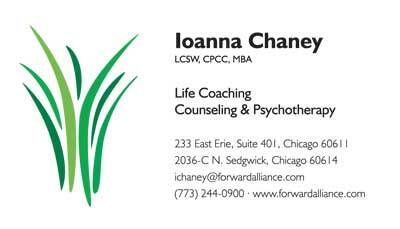 In our initial discussions, we touched upon the need for a visual identity that would link the website, the mailer, and her business card and decided that the first step was the creation of a Forward Alliance logo (something she had not previously considered). Building on Ioanna’s core mission of promoting personal growth, Katie and I collaboratively came up with the mark below. From there, we moved on to creating the business card and mailer, with Katie doing the majority of the work on these. 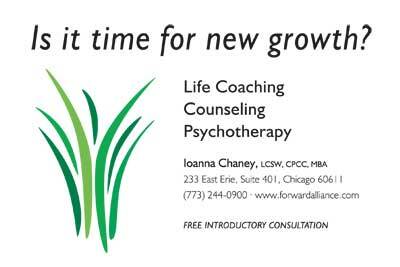 Ioanna chose to focus these pieces on the message of growth conveyed by the grass portion of the mark, rather than the entire mark, since she felt that they were intended more to market her personal services rather than the business as a whole. Finally, I set to work on the website. The goals of this portion of the project were to create a standards-compliant (and therefore more search-engine friendly) site, with a cleaner, more polished look that was still friendly, warm, and welcoming. Since frequently updated content is also more attractive to search engines, we also decided to convert the “Tips” section of the previous site — in which Ioanna had posted some of her favorite quotes and sayings — into a blog-like section of the site called “New Growth.” The tips section has always been a favorite of her clients, and now they have the capability to have new tips delivered directly to the their inboxes or feed readers. If you have a chance, take a look at the site and let me know what you think! 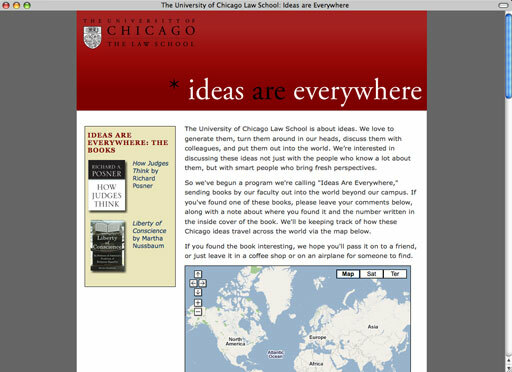 Last week, the University of Chicago Law School unveiled two new websites, designed and built by yours truly. One is an online version of our alumni magazine, The Record. The Record Online will contain many of the same stories as the print version of the magazine, but will enhance them with extras like audio and video, as well as the ability for our readers to comment on the stories. 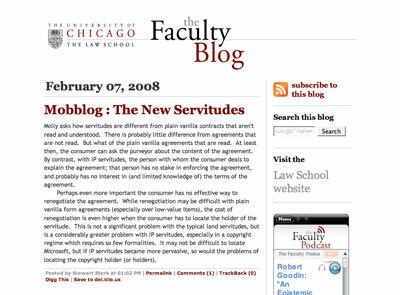 The second site is one devoted to a little experiment that we’re running here at the Law School, which we’re calling “Ideas Are Everywhere.” The plan is to send copies of our faculty’s more accessible works (beginning with Richard Posner’s How Judges Think and Martha Nussbaum’s Liberty of Conscience) out into the world, with labels asking people to visit the “Ideas Are Everywhere” website. We’ll ask them to tell us where they found the book (which we’ll track on a Google map), and what they think of the ideas contained therein; we’ll also request that they pass the book on by leaving it in a coffeeshop, on an airplane, or anywhere else an interested party might find it. Certainly, neither of these sites is earth-shaking in regards to its design or functionality. But they each gave me a chance to try something new. 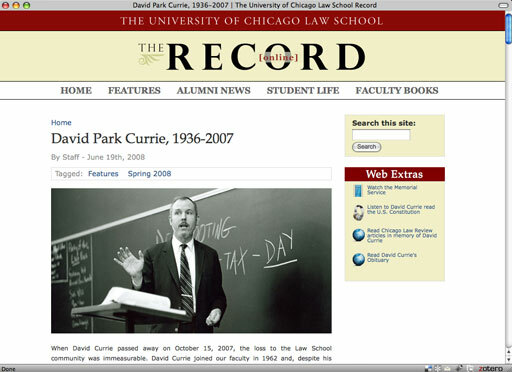 The Record Online was my first stab at creating a site using the open-source content management system Drupal, which we’ll be adopting when the Law School launches its new primary website in the fall. It gave me the chance to poke around under the hood and try to wrap my mind around the way Drupal works (though I have much, much more to learn!). The “Ideas Are Everywhere” site, on the other hand, is built on Typepad (which we also use for our Faculty Blog); the challenge here was to make a site built on a blogging platform feel as little like a blog as possible. Given that I had about a week to get the site up before the first books were to be distributed — projects at universities seem to either drag on interminably or have to be done immediately — I needed to be able to quickly and easily give readers the ability to comment and to subscribe to comment feeds. Using Typepad but removing many of the traditional markers of a blog seemed to be the most time- and cost-efficient way of doing so. So what do you think? See any room for improvement on these sites? One of the greatest frustrations for those of us working in web design is the incredibly small number of typefaces available for us to work with. Web browsers can only display text in fonts that are already installed on the user’s computer, and since only a handful of fonts are installed on almost every computer the designer’s palette is limited. Of course, people have found ways around this — first by making type as images (which unfortunately renders that type unsearchable and less accessible to those with disabilities), and then by using techniques such as sIFR (which requires the user to have the Flash plug-in installed in their browser). The holy grail for web designers, then, is the ability to embed font files themselves in a web page so that anyone who views the page can see the text in the intended font, whether or not they have the font installed on their computer (see a proof of concept here). I think it is inevitable that this will happen eventually, but it raises the question of how font designers and type foundries will be paid for the work they do. Right now, as I understand it, they get paid by licensing their fonts to be included in operating systems (Mac, Windows) or software (e.g. Adobe’s applications), or individual users can purchase the rights to purchase a font file and use the typeface in personal or commercial products. But if the fonts are essentially downloadable at any time by anyone for free, where is the incentive for type designers to continue investing the considerable amount of care and time necessary for producing a quality font? In a lot of ways font designers and type foundries find themselves in situations similar to those of musicians and record companies. Because fonts are digital files they are, like .mp3s, incredibly easy to copy and redistribute (or “pirate,” as the RIAA would have it). It must not be possible to include digital rights management (DRM) measures in font files, or I’m sure the big foundries would have done so already. Instead, font producers try to cover their costs by charging astronomical sums to those who do wish to use them legally (non-designers might be surprised to learn that individual fonts can often cost up to $400), just as prices for legally purchased music have failed to fall appreciably, despite the fact that the cost of distributing that music is approaching zero. Both industries, it seems, are locked into pre-Internet business models that lead only to the frustrated customers — and, as a result, “stolen” files. How then, might type designers adapt to new distribution models in a way that would both satisfy their customers and make money in the coming age of embeddable fonts? The changing music industry may be a model for the solution, as well as the problem. Sell fonts as a loss leader for other services. Just as many musicians have had to begin thinking of recorded music not as their primary product, but as a way to promote their other services (touring and performing) and products (merchandise), so font designers could use free versions of their fonts as promotional tools for any number of other services and products, from printing to web design to (in Adobe’s case) software. Free version/Pro version. Some font designers already do this, allowing free use of “lite” versions of their fonts for personal use, and requiring licenses for commercial use. This is not unlike the recent experiments by Radiohead (with their “In Rainbows” album and Nine Inch Nails (with their album “Ghosts,” among others), where basic .mp3s were made available for free with the hopes that the artists could recoup their costs from more elaborate packagings of the material (hi-fidelity box sets, for example). License their fonts to browser manufacturers. In the same way that font designers license their products to companies like Adobe, they could strike deals with browser manufacturers to package them in browser software. Unfortunately, I can imagine there might be problems getting licenses for opensource browsers such as Firefox. Taxes. The most controversial means of font designers recouping costs on illegally shared font files might be something like that proposed to get record companies a share of money from their pirated music files: a tax on internet connections, to be charged by Internet service providers, which could then be distributed among the people who own the legal rights to files (see here and here. There is a significant downside of this plan, in that the logistics of distributing the revenues it generated would probably be quite difficult; however, it would likely be less difficult to implement than the licensing fees charged by performing rights organizations like BMI and ASCAP to live music venues, which allows any performer in those venues to play songs to which they do not own the rights. Moreover, it would both allow web designers and website users to have access to a much greater variety of typefaces and ensure that designers of those typefaces would be compensated for their work. Yes, I’m coming to this party rather late — if I’m going to drop several hundred bucks on a gadget, I want to be sure that all of the bugs have been worked out before I do so. But about three weeks ago, armed with an Apple gift card that my wife gave me for my birthday, I finally took the plunge. And I have to say that — despite all the geeky hype and the fact that I’ve been a Mac user for fifteen years, and thus should no longer be surprised by anything they do — the iPhone has blown me away. Sure, there are problems — AT&T’s Edge network really is as slow as people say, and if your fingers are larger than an eight-year-old’s you will spend a lot of time backspacing over typographic errors. But overall, the device is a joy to use. When you work with computers all day every day you constantly bump up against applications and devices that were obviously designed by programmers or engineers of some sort, and that are thus designed FOR programmers or engineers. The all-important empathic act — transporting yourself out of your own head into the head of a user with entirely different experiences and goals — is usually the missing step that could have made these products great. But with the iPhone, as with most of its products, Apple puts the user experience first. It takes an extraordinary problem — how do you provide much of the functionality of a personal computer on a tiny mobile device? — and provides simple and elegant solutions. For this reason alone, the user interface is beautiful. But the real magic, as with all good design, happens in the details. Just as one example, consider the way the screen appears to bounce a little bit if you scroll quickly to the top or the bottom of the screen. This tiny detail, which on the surface seems gratuitous, pulls you into the tactile world of the interface, giving you the impression that you are interacting with a physical object rather than pixels on a tiny screen. On a recent episode of Design Matters, Petrula Vrontikis said something that, well, made my ears perk up. When host Debbie Millman asked whether she preferred working by hand or working on the computer, Ms. Vrontikis responded that she works “mostly… with [her] ears.” Listening, she reminds us, is the root of design work — listening to what your client says, and translating that into a piece of visual work, is what good designers do. Of course, what your client says and what they think they want may be two very different things, but we’ll leave that for another day. In an earlier post, I mentioned that one of my favorite podcasts is called Freelance Radio; it discusses all manner of topics relating to doing freelance work of any sort, from dealing with difficult client to drumming up new business. I just happened to listen to Episode 9 of Freelance Radio, which features a “Mailbag” question from yours truly about how the practical matters necessary to prepare oneself to freelance full-time (don’t worry, I’m not going to quit my day job just yet). Thanks to the folks at Freelance Radio, and keep up the good work! While my day job as Manager of Electronic Communications at the University of Chicago Law School tends to lean more toward the tech and information architecture sides of web-work than the design side, I do occasionally get to undertake projects that use as much of the right side of my brain as they do the left (while our upcoming site-wide redesign promises to explode both sides). 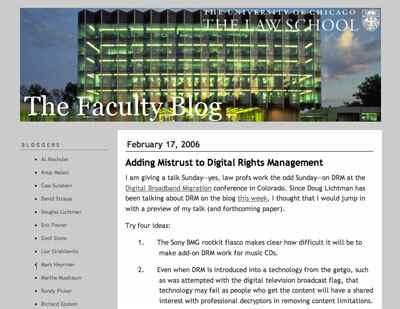 When I redesigned it this past fall, my primary goal was to make it more usable — get rid of the gray text on a gray background, add a prominent search box and make it easier for visitors to subscribe to the blog and get to the Law School website. I also separated out the podcast feed and added a widget in the sidebar so people could listen to the podcasts without leaving the blog page. I also used this design as inspiration for a Flash e-card that the Law School’s Annual Fund asked me to create. Considering it was my first attempt at Flash, I think the card came out pretty well. This was an especially fun project because I had the chance to create the music for the card as well. The music for these things is usually classical music calculated to be almost unnoticeable. I used a collage of samples from Apple’s Garageband program to create a piece that sounds to me a bit like it could have come from “Six Feet Under;” I even had someone ask me where they could purchase a copy. I am still occasionally uncomfortable calling myself a designer. It’s a mantle I didn’t adopt until I was almost 30. For most of my life, I’ve thought of myself as an academic, someone whose trade was in words; more specifically, my interests revolved around story-telling, and the study of how and why people tell “the same” story in different ways, particularly when people use such stories to transmit complex religious and philosophical ideas. This fascination with story runs deep in my consciousness. On one of my favorite podcasts, “Design Matters,” host Debbie Millman often asks her guests the question (which she admits to lifting form Milton Glaser): what is your first creative memory? If I ask myself this question, I find a neatly packaged origin story for my lifelong interest in narrative. As a young child in the heyday of Star Wars mania, I had dozens of the little plastic action figures (“They’re not dolls!” I insisted) based on the film, for which I would construct and act out elaborate stories that were grounded in the universe of the movies but taken in very different directions — I distinctly remember a visit by an Imperial Star Destroyer to a fast-food drive-through, for example. Often, I would play out these scenarios over and over, making tweaks to the storyline here and there, until I either got them just right or simply abandoned them in favor of a new idea. From Star Wars I moved on to classical mythology, then Arthurian legend, Celtic myth and Joseph Campbell in high school. At Oberlin College, I created an individual major in Comparative Mythology. One of my advisors was an expert on the Ramayana, a Hindu religious epic that has been told and retold countless times over the last two millenia. In the last twenty years or so, the story has become embroiled in Indian political disputes due to its adoption by the Hindu right as a kind of acid test for determining the boundaries of the Indian nation; these political disputes were also closely linked to traditional and modern visual representations of the story. This interest launched me into graduate school at the University of Chicago Divinity School, where I earned a master’s degree and put in an additional three years in the History of Religions Ph.D. program, studying the ways in which religion, the idea of the nation, and visual media overlap in South Asia. In the meantime, I had become a designer almost by accident. Though I had grown up in a house full of art and interest in the visual — my mother was a landscaper and my stepfather an illustrator and graphic designer — I had never thought of myself as having much artistic talent. After all, I couldn’t draw or paint. In the year between my graduation from college and beginning grad school, however, I took a job as electronic projects intern in Oberlin’s Office of College Relations and discovered the power of computers for creating visual artifacts, as well as the unique challenges of information architecture for the emerging medium of the web. When I headed to grad school, I took a work-study position building websites and later designing print materials for an on-campus research center. I discovered to my delight that design was not all that different from the story-telling that I was studying in my academic life — at it’s core, all communication is about telling a story, but I was now telling stories with image and typography rather than words. I’ve come to realize, however, that a designer is really a problem-solver. A degree in design is an excellent way to gain skills in solving problems of visual communication, but it’s not the only way. Since the day I decided this was going to be my career, I have immersed myself in books, discussion boards, mailing lists, conversations and podcasts devoted to design — I am constantly reading, listening, and observing the world through the lens of one who must help others communicate visually, learning through experience what works and what does not. Perhaps the best piece of advice I’ve ever received was from a designer friend, who said the best way to learn design was simply to “Look at everything.” And I’ve never looked at anything the same way since.